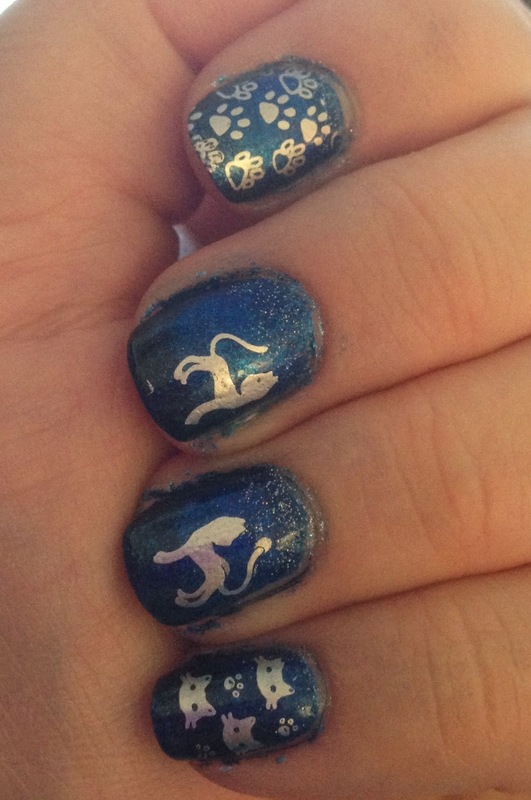 When I got the prompt for Blobbicure I thought I had a really good idea. But I really messed up on it! 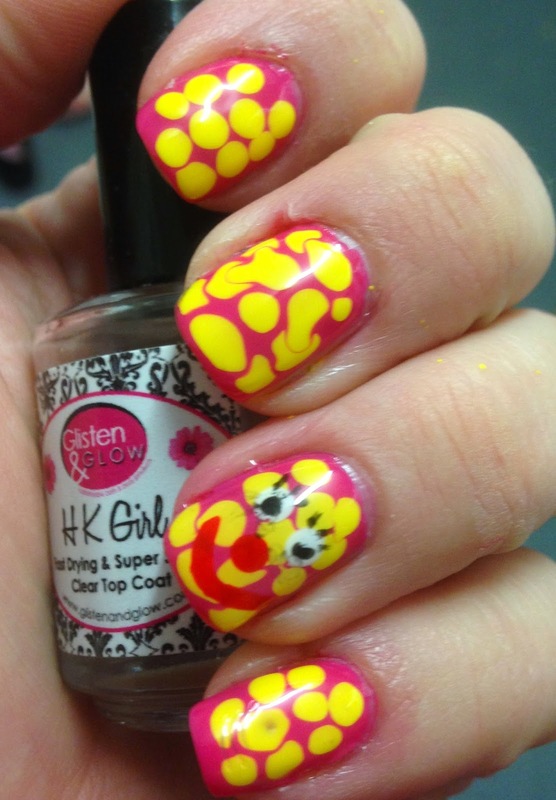 This is my first attempt at a blobbicure tho. 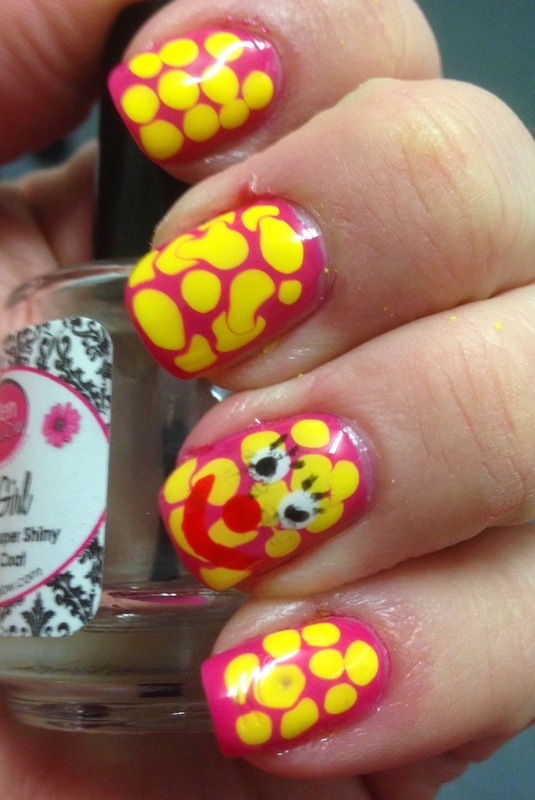 The name blobbicure just screamed Mr Blobby at me so I had to do my mani based on him. But I messed up on his face lol. So please excuse the slight splodging but I couldn't redo it and I didn't want to miss a day! Well there you go. Let's hope I do better with day 11! There's some much better attempts below - please check them out! 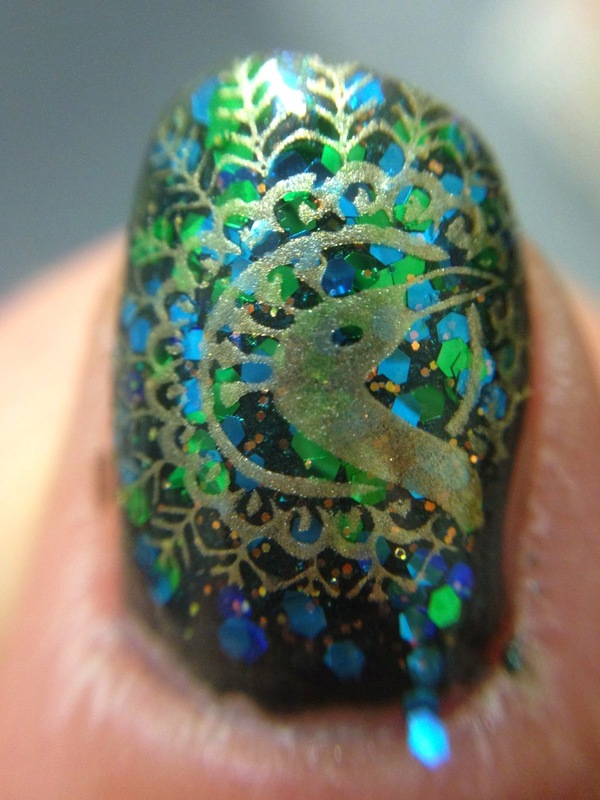 The Mani Cafe did a gorgeous giraffe print! 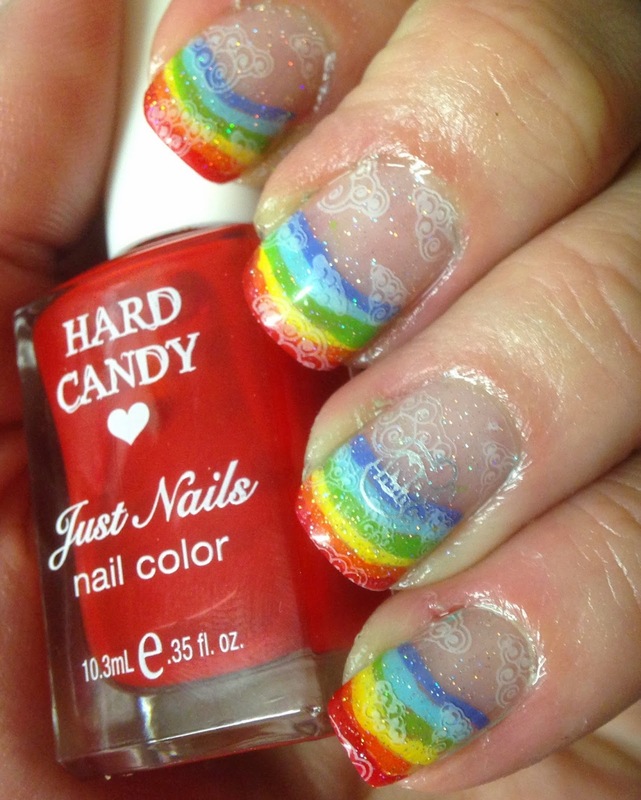 Day 9 and the prompt for today was Rainbow. I had lots of ideas for this part of the challenge but in the end I went for a mani inspired by one of my favourite nail artists on instagram, @YaGala. 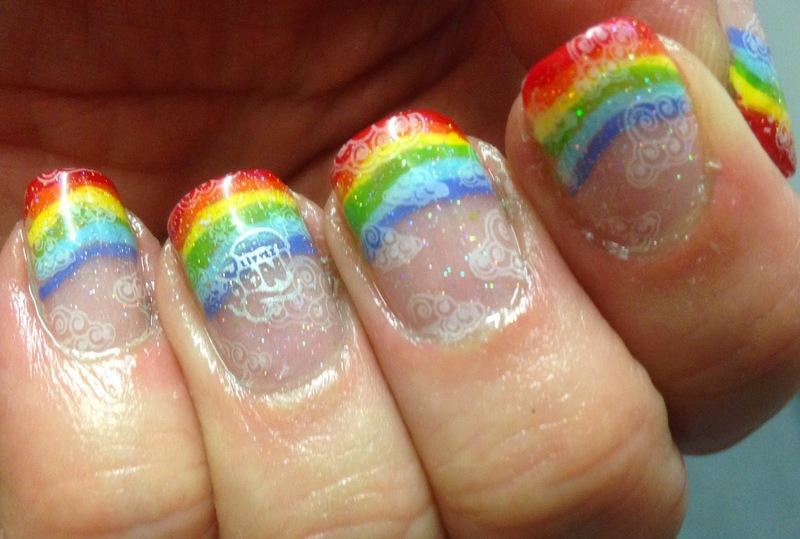 You can see which of her manis inspired me here. Please check it out because hers is a much better version! 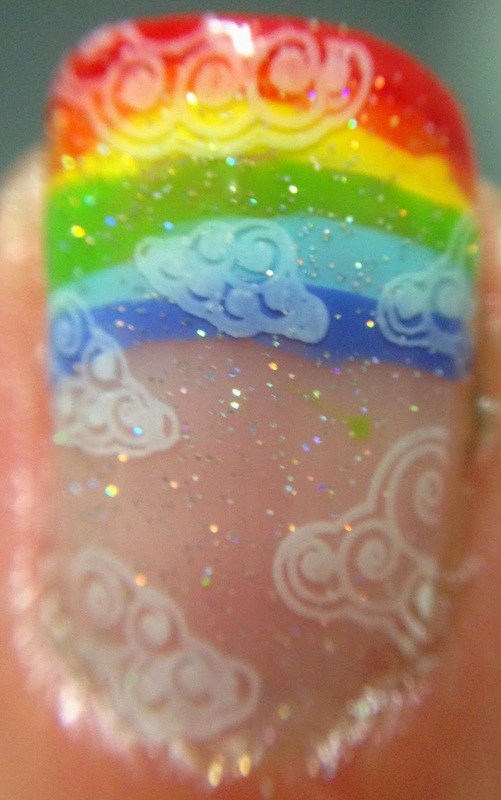 I was also slightly inspired by my daughter who loves all My Little Pony things, and the Rainbow prompt reminded me of Rainbow Dash, so I stamped clouds in reference to her clearing the skies! 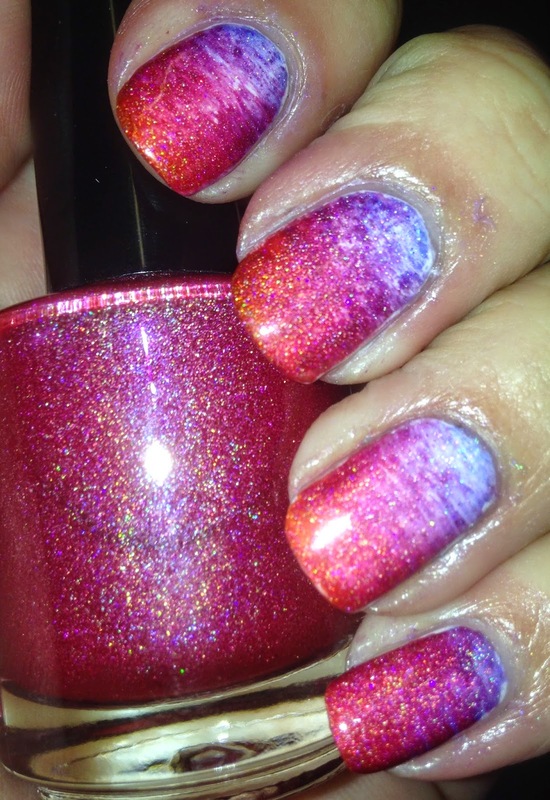 Anyway, sorry my post is a day late, this mani took me much longer than I thought it would! 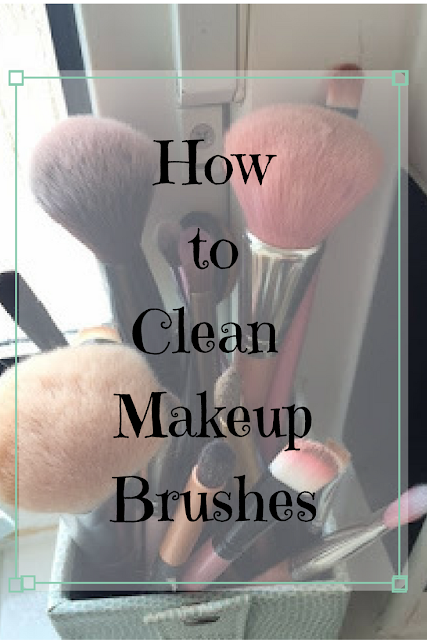 Ok, this prompt nearly made me hang up my nail polish brushes. I can't draw. I really can't! So trying to recreate a piece of art struck terror in my heart! 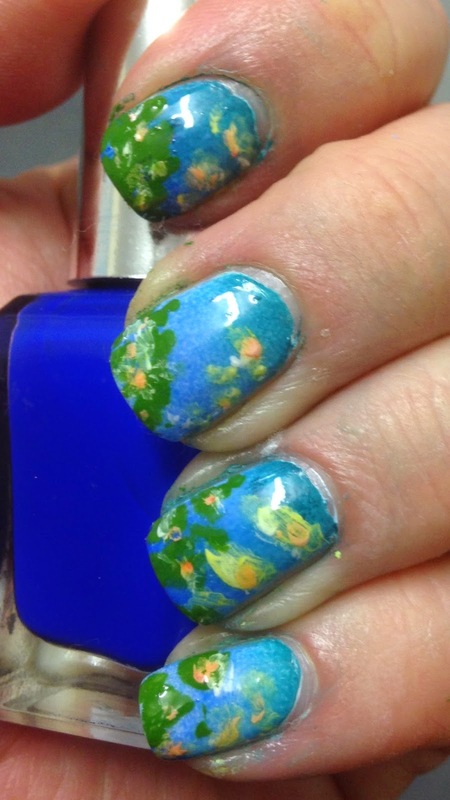 However I have a real love of Monet and really wanted to try to recreate one of the water lilly paintings. I'm really pleased with how this turned out. 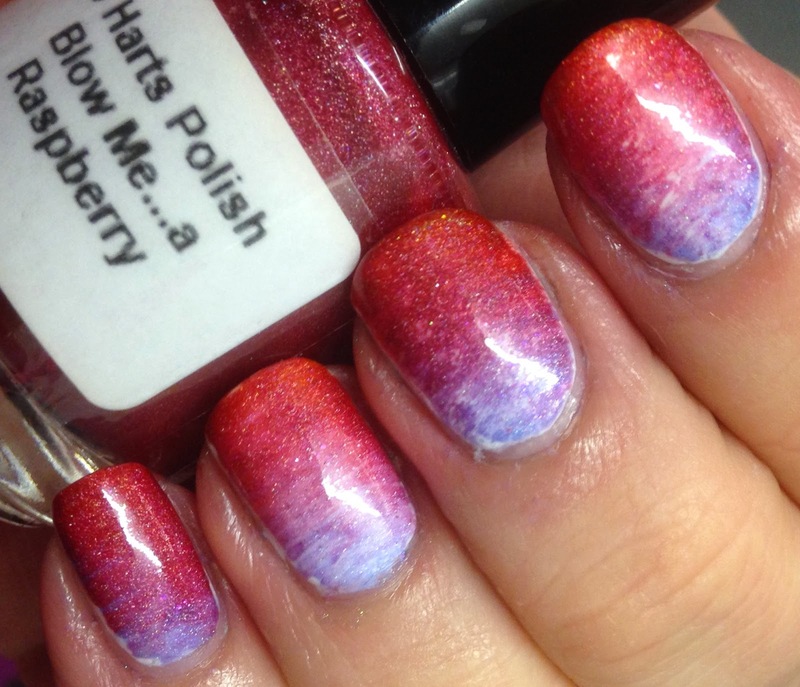 I used Barry M Gellies to do a gradient (I'm loving gradients at the moment! 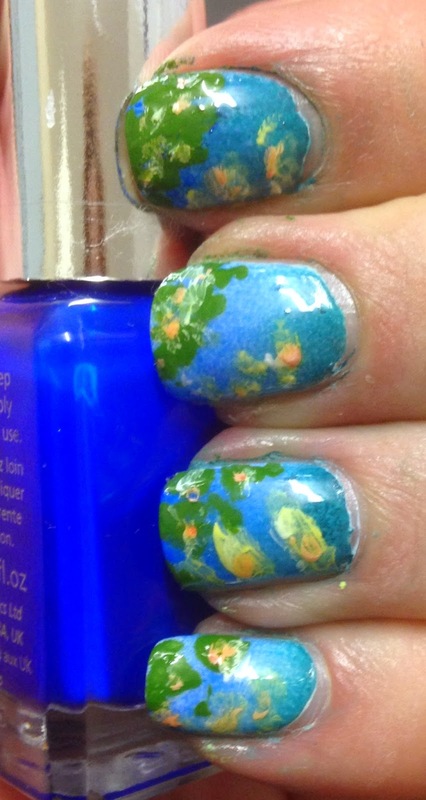 ), and used acrylic paints for only the second time to create the water lillies. 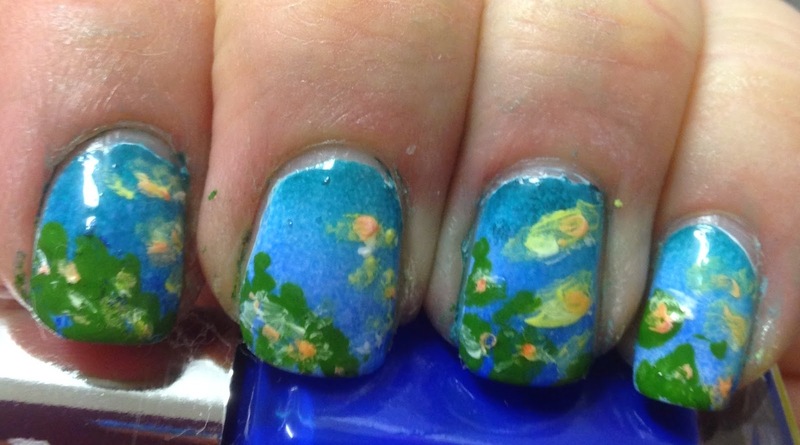 The camera didn't quite pick up the pictures and my clean up wasn't the best and although this isn't my favourite mani of this challenge I'm still quite happy with it. This day of the challenge had me puzzled. I couldn't find any inspiration but in the end I came up with peacocks. 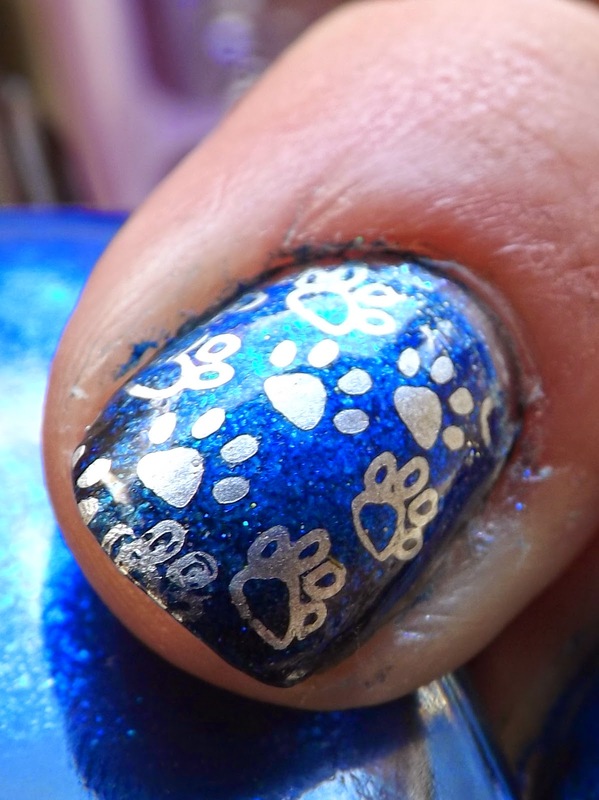 My nail art sucked on this one but I liked the stamping! 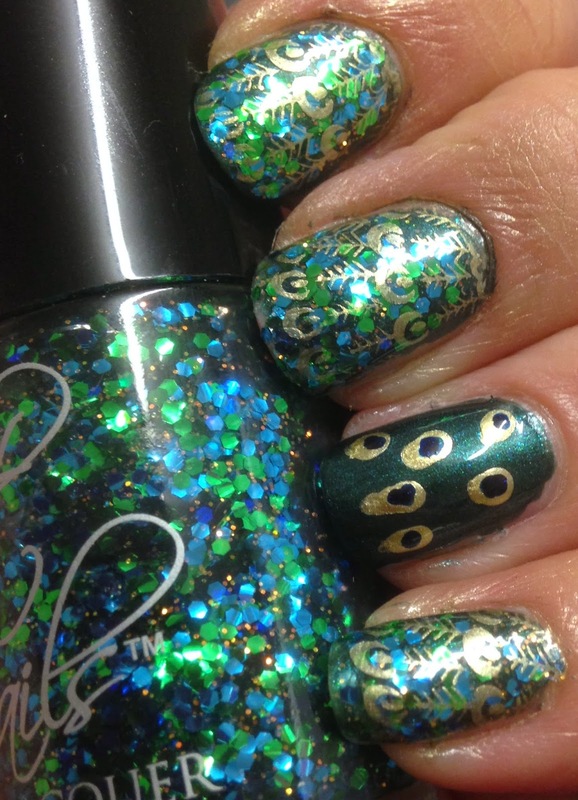 I used Illamasqua Viridian for the base, Cult Nails Dance All Night for the glitter, Barry M Gold Foil for the stamping and the gold bits and Illamasqua Phallic for the blue. Day 6 and I'm still here! That has to be some kind of record! Almost on the home stretch! I didn't quite manage to get all the colours in. 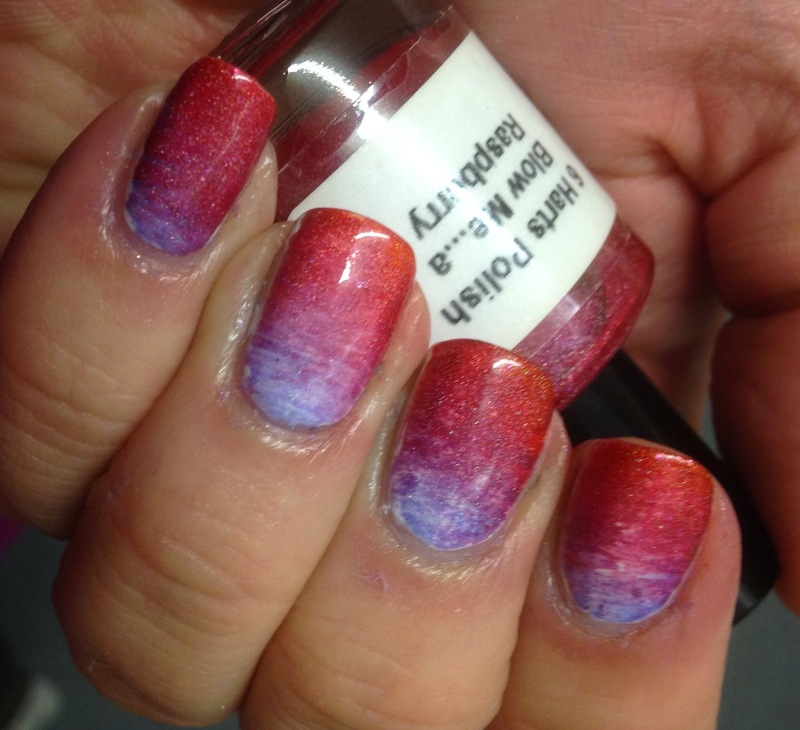 I think I may have another go at this one another time, but this was my first attempt at doing a fan brush gradient, and as first attempts go I don't think this was too bad. 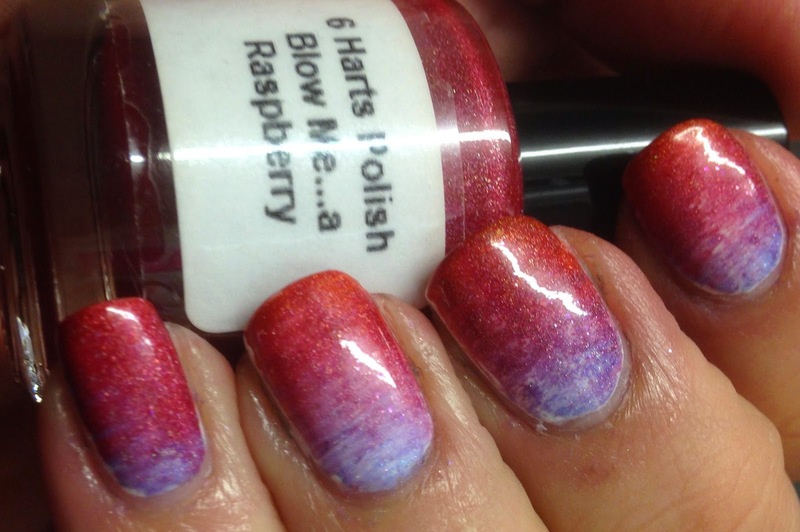 I used a selection of Darling Diva polishes along with 6 Harts Blow Me a Raspberry, all beautiful delicate holo polishes. What do you think for a first attempt? By the way, if you can recommend a good one coat white I'd be ever so grateful! 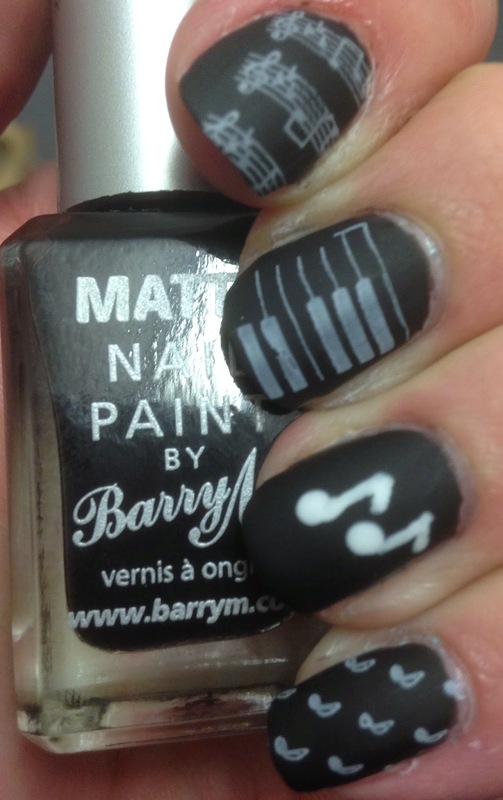 The one thing I hate about nail art is the frequent need for a white base and I always struggle to make them non streaky! Boy, did this challenge cause some consternation! No-one was quite sure what it meant! But Debbie from The Crumpet confirmed that it meant the opposite of what things should be, so I did white musical notes on a black background. I thought it looked better matte :). 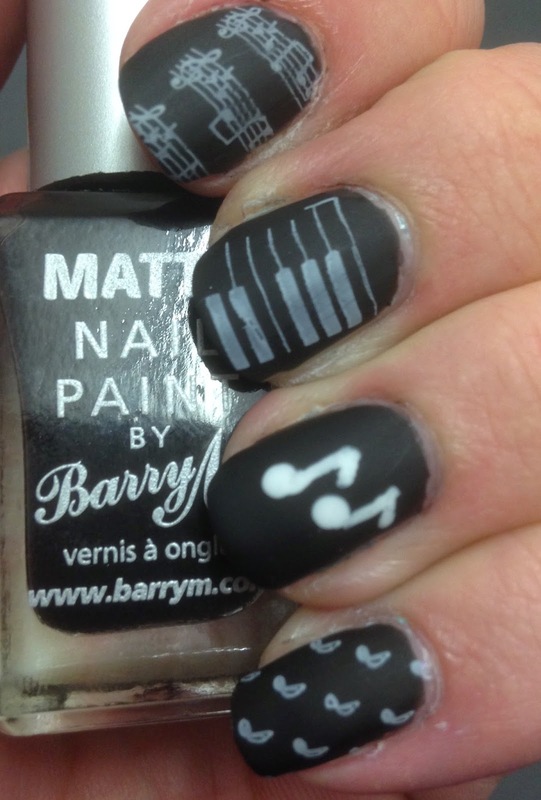 I used Barry M Matte Black for the base and Barry M White for the stamping. I'm amazed I've actually kept up with this challenge so far! Today's challenge was Monochromatic which I initially thought was black and white but then I looked up the definition and it turns out its actually varying shades of the same tone. So I've done my best, using my new Creative Shop stamper (yay its really soft and sticky and the scraper is oh my goodness!) 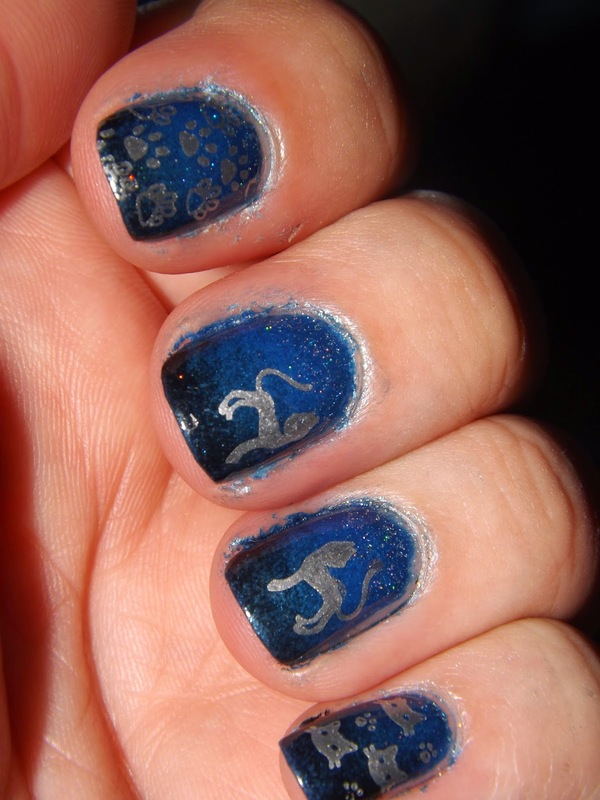 and double stamped which is something I've wanted to try for a while. 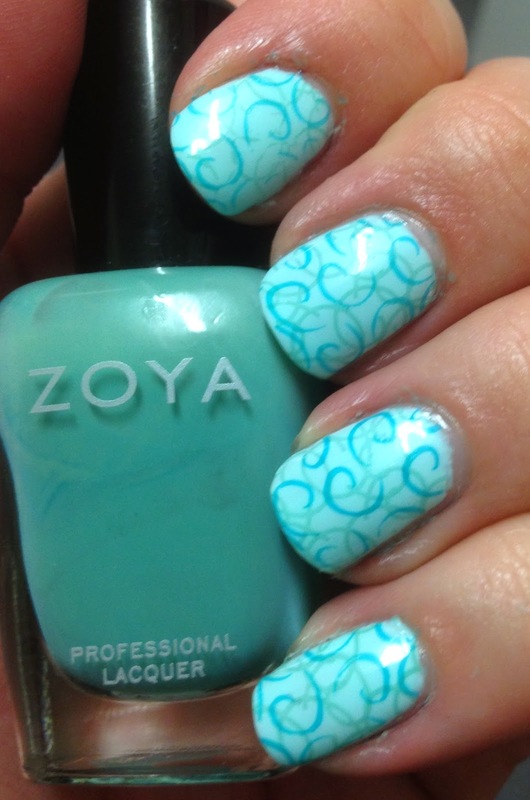 The base is Barry M Gelly Sugar Apple and I stamped with Zoya Wednesday and Barry M Gelly Guava. 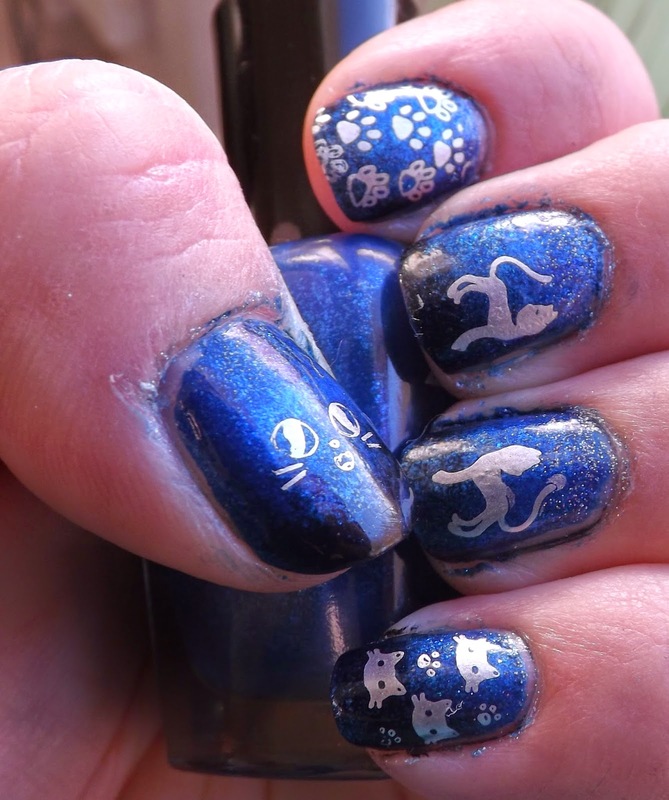 Yesterday I got a wonderful nail mail package in the post from Jennifer at Jen's Nail Files and I had to use some of the lovely polishes in it straight away for today's challenge. 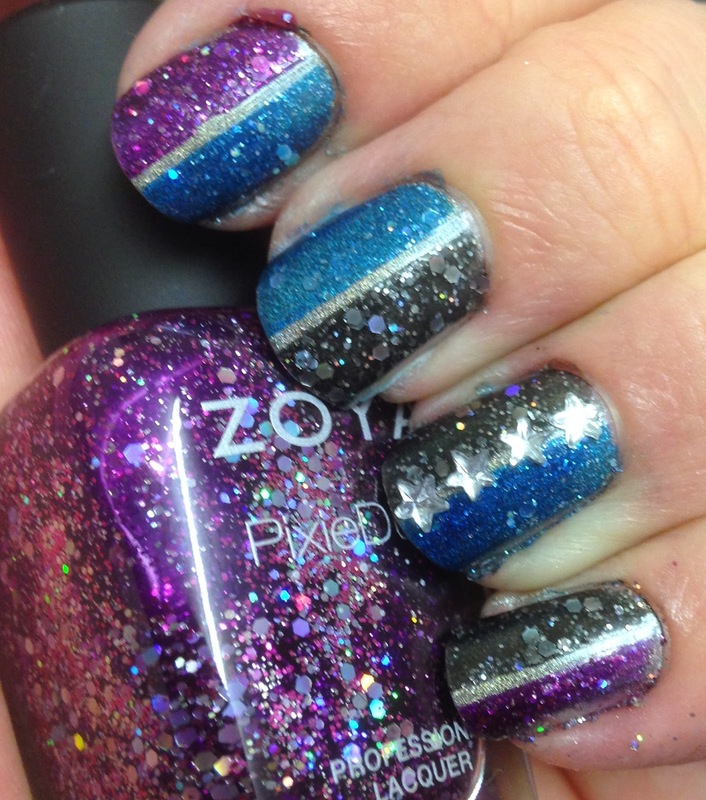 So I chose to use the beautiful Zoya Pixie Dusts in Thea, Imogen and Nori over the top of a Kiko holographic polish, and used striping tape to create the half and half design. I then added little gems to my ring finger as an accent. I love gems but they catch on my clothes and hair so they never last on too long! 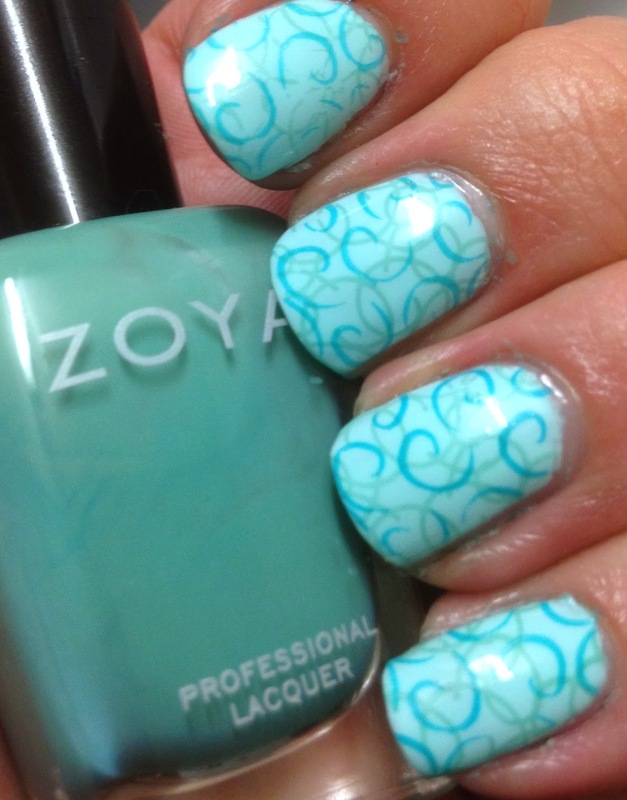 I loved this mani, although simple it was really pretty to look at. 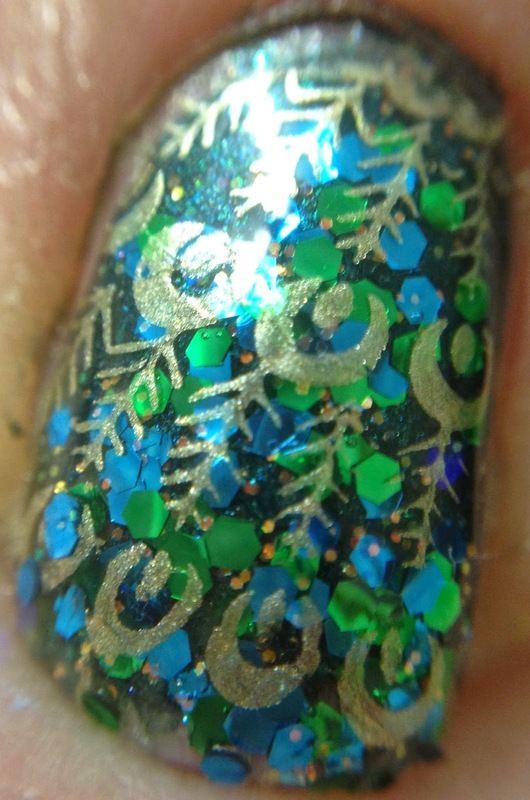 I just couldn't quite capture the sparkle with my camera. 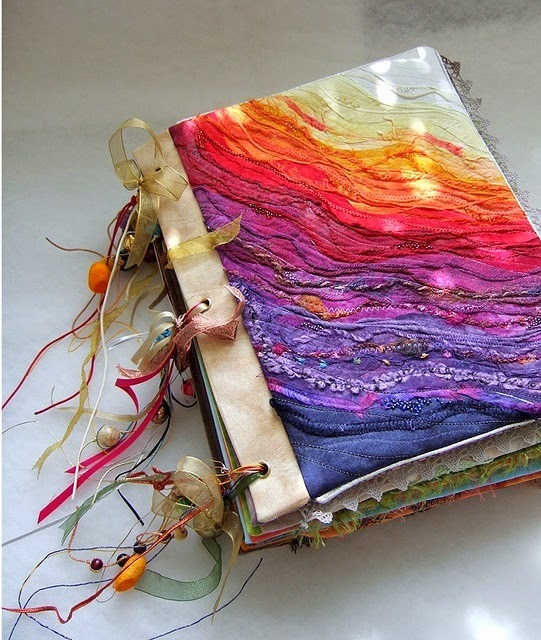 Please take the time to visit the other bloggers who have taken part in this challenge. 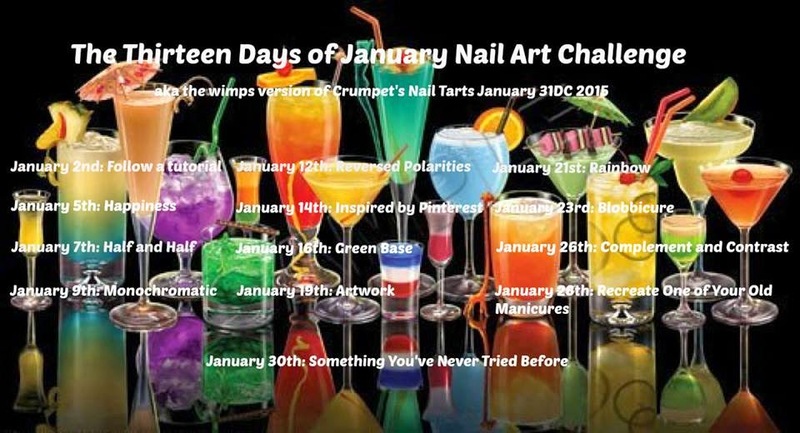 The 13 Day challenge is an abbreviated version of the 31 Days of January Crumpets Nail Tarts Challenge. I know, I know, 2 blog posts in less than a week! Well I'm trying to keep up with this challenge. So here goes, Day 2. 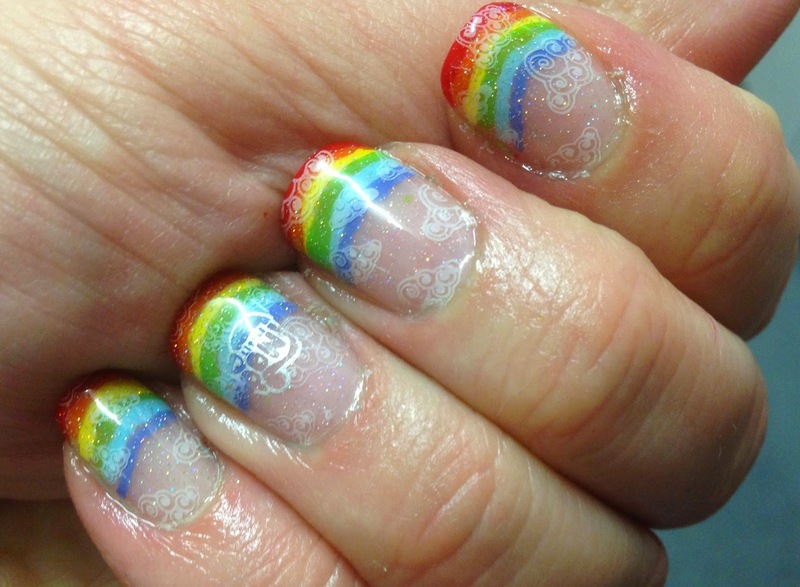 Today's prompt was 'happiness' which threw me for a spin, because how do you show happiness on your nails? So I went for something that makes me happy, which is cats. How can a cat not make you smile?! 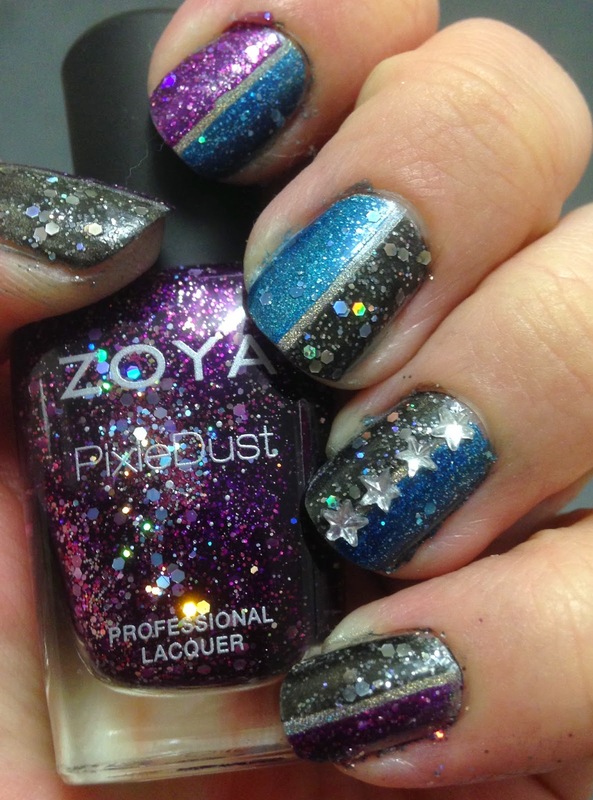 I did a gradient base using Wet and Wild Black Creme, Zoya Song and China Glaze Fairy Dust to try and create a starry night time look. 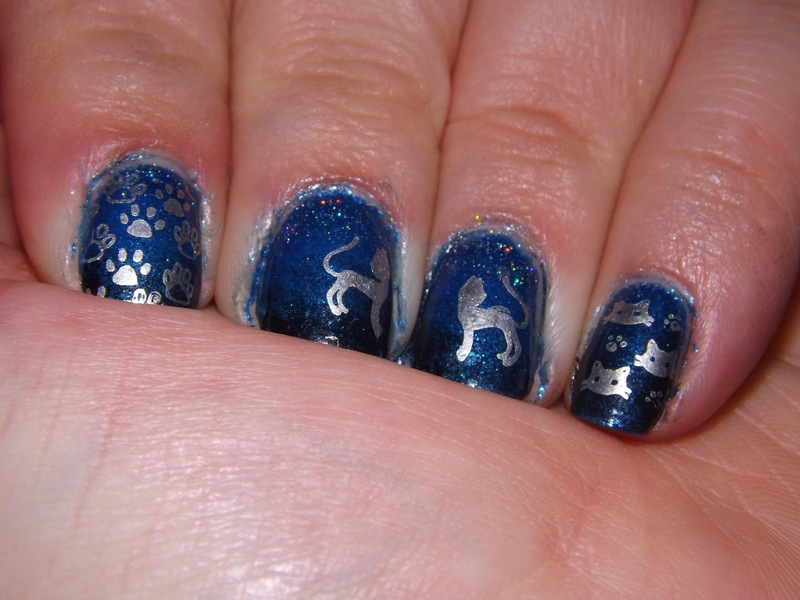 I then stamped over it using Barry M Silver Foil with as many cat images as I could. Somehow, by watching loads and loads of instagram videos, I've managed to work out how to stamp. Yay me! 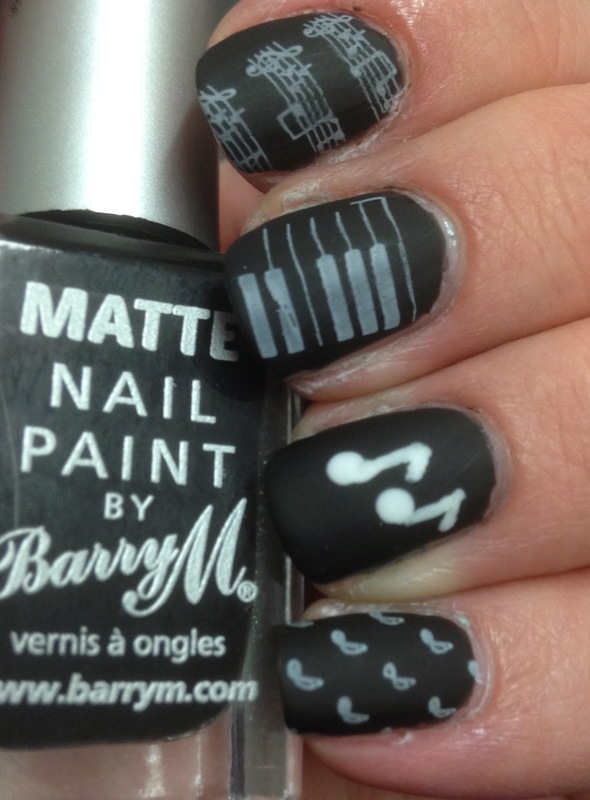 The right polishes help too! My apologies for the clean up by the way. I did do a clean up but looking at the photos I managed to make an awful job of it! Must try harder! 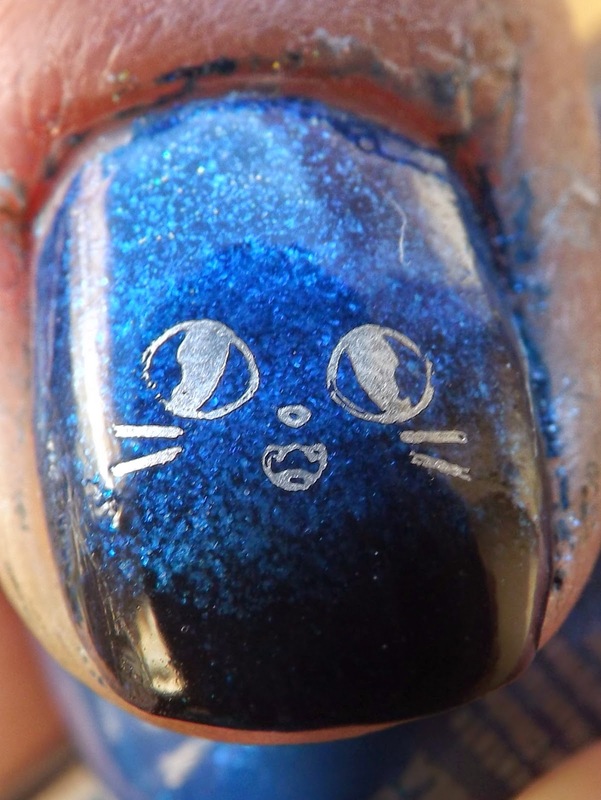 To be fair tho, I do find blue one of the hardest polishes to clean up! I know, I know, its a bigger hiatus than Sherlock. I've still been doing my nails but not blogging so much. And my blog could do with an overhaul. But when I saw the Crumpet's 31 Day Challenge for January I felt like pushing myself. There's no way I can keep up with the 31 Day Challenge but I thought I might be able to keep up with a reduced version of it. 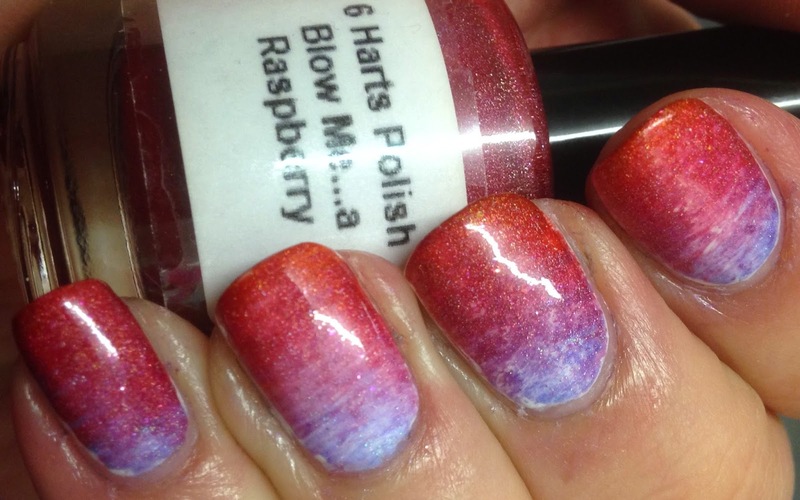 A few of the bloggers are following a 13 Days of January Nail Art Challenge so I'm joining in. 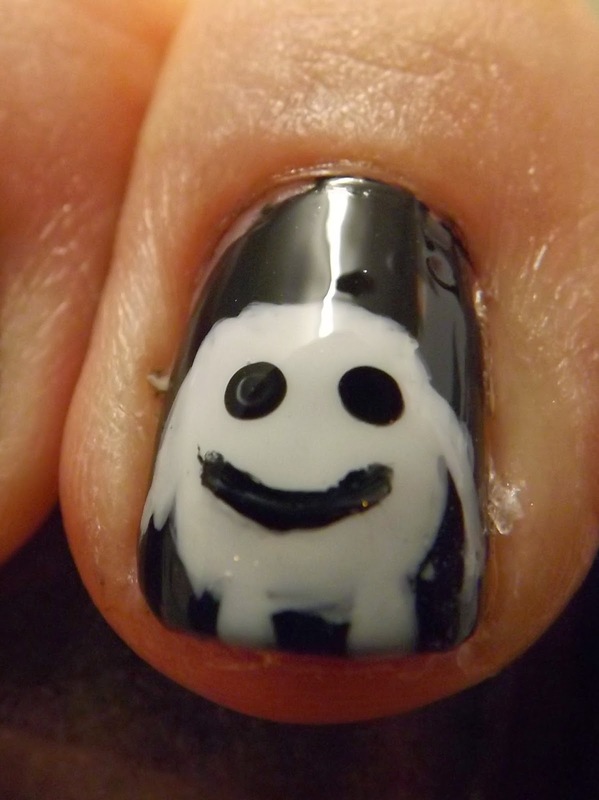 The first day's challenge was to follow a tutorial so I decided to follow one of the awesome Adventures in Acetone's Adipose tutorial. 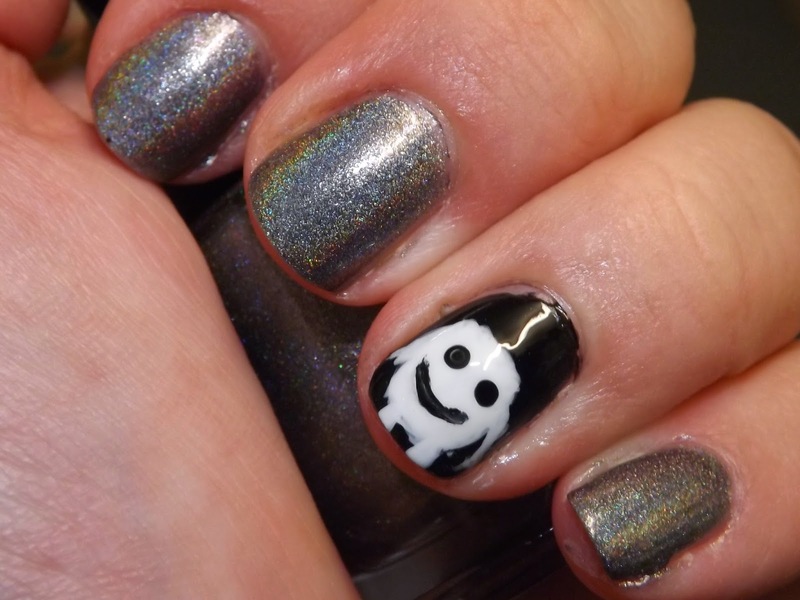 The rest of my mani is an appropriately named polish from Pahlish's Doctor Who collection, The Ghost Shift. 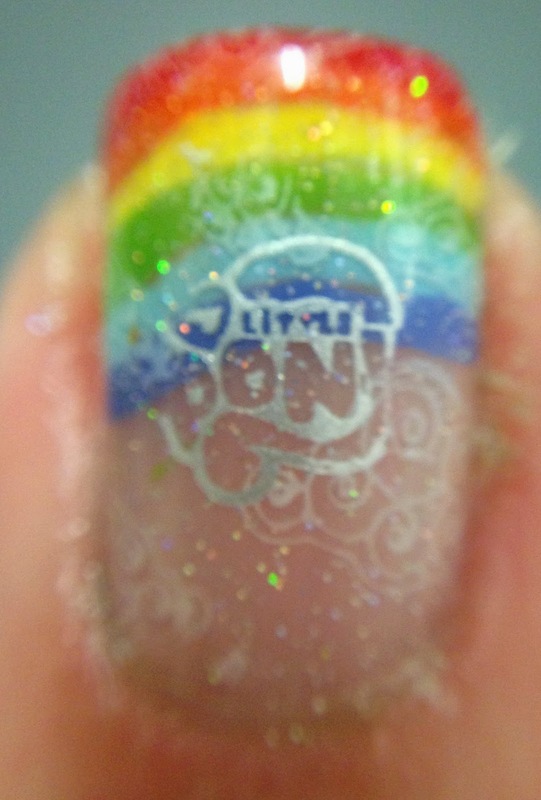 This is the first time I've attempted to paint a figure on my nails and I'm quite pleased with how it turned out.